Hot chicken is an iconic dish from Nashville, TN that was first served at Prince’s Hot Chicken Shack. Their recipe is a secret but we made a version at home, with olive oil. 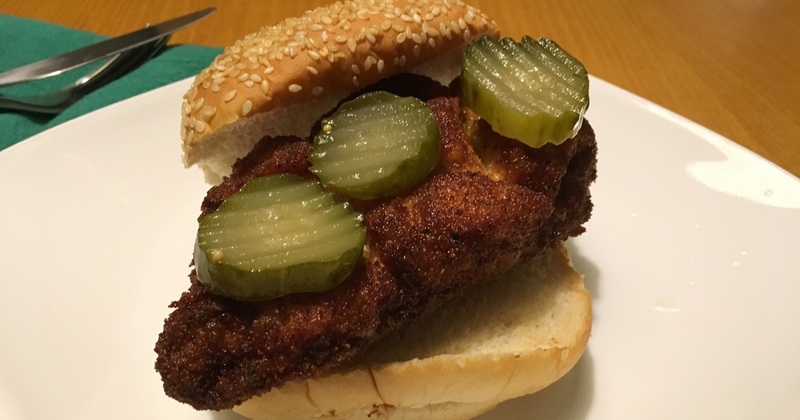 After watching the below video, we were inspired to try making a Nashville Hot Chicken sandwich at home. However, we wanted to fry the chicken and make the sauce with extra virgin olive oil. Here is our modified version of the recipe, made with EVOO. Score the chicken as shown in the video above. This was a great tip; it sped up the cooking time significantly. Fry in extra virgin olive oil heated to 300°. We shallow fried in about 1 inch of oil and flipped halfway through. When cooked through, remove from oil and drain on a wire rack. Pour over the chicken. Serve on a bun with bread and butter pickles on the side. The EVOO version turned out great. The chicken was perfectly crispy and browned nicely. We didn't feel that it was greasy at all. The sauce had an olive oil taste, which we enjoyed. If you are looking to lower the cost of the frying oil, you could substitute with olive oil or light olive oil, which has a lighter taste and is less costly.